Although I wrote everything I know about squirrel issues for this website, oftentimes a problem with squirrels in the attic is beyond the scope of the do-it-yourself homeowner to solve. I have found a professional company in Syracuse, New York that handles problems with wildlife. Animal Control Services of CNY has access to tools, techniques, and experience that help them do a far better job at wildlife removal than a non-experienced homeowner could. They possess licensing that allows them to do certain types of work legally, that non-licensed homeowners in the state of New York are not allowed to do. For the welfare of your situation, and the squirrels, in some cases it's best to hire a pro. There are good companies and bad companies out there. I've done research on such companies, to get to know them, and feel confident recommending their services. I therefore recommend a company called Animal Control Services of CNY which services Syracuse, New York. If you have a squirrel problem, or any other conflict with a wild animal, and live in Syracuse, I am confident that this company, Animal Control Services of CNY, is the one to call. I asked the company to describe their service range, and they said this - We operate in the greater Syracuse and surrounding suburbs. We cover all of Onondaga county and parts of Madison and Cayuga counties also. Towns we cover include Liverpool, Solvay, Fayetteville, Manlius, Chittenango, North Syracuse, Pompey, Tully, Lafayette, Minoa, Bridgeport, Salina, Cicero, Baldwinsville, Skaneatles,Camillus, Onondaga, Clay & Brewerton. Animal Control Services of CNY operates 24/7, so don't hesitate to call at any time to discuss your wildlife problem, and schedule an appointment for same-day or next-day service. Thanks for the excellent learning experience. It's unfortunate that I live in Syracuse NY, so you have no recommended contractors in my area. I may try the traps that let them out of my attic, but not in, if I can find them in my area. I live in Southwestern NY. I have ordered the device that let's them go out, but not back in, and plan to install it in a few weeks, to insure that the babies will follow their mother out of my attic. Then, we'll seal up the holes. I had no desire to trap the animals. Again, David, thanks for your info. I also have a question for you. If I exclude the female from the attic, will the young be active & smart enough to follow her out at some point, or will she just try another way to enter. I'm pretty sure the young will be able to exit, since they're quite active. I can hear them running through the attic several time per day. I got the "device" at online superstore, called a squirrel controller. I bought the larger of the 2, 12" x 5" x 5". I'll let you know if it works. Yep, the young ought to be smart enough to exit, so long as they're at least 5-6 weeks old. Thanks, David. Let's hope the "controller" is built well enough to let them out, and not back in If you'd like, I'll let you know what happens. If I had the wherewithal, I'd build a version of this controller, with heavier gauge wire, and tweak the spring mechanism a little, but maybe it'll work. We'll see! Hey David, I am leaving in a few weeks for our annual Canadian fishing trip. I just heard from the group that just left our camp that there is a red squirrel in the wall of the log cabin. These are pine logs, likely 80-90 years old as the lodge was previously a base camp for a fire watch tower crew. Pic attached of the front of the lodge. Most of the rest of the lodge has T-111/plywood covering the outside of it as it continues to decay. The squirrel has gnawed it's way through several of the logs and sandwiched it's nest somewhere between the logs and outer plywood. The folks did put a plywood piece on the inside wall as they felt the squirrel was close enough to coming through that they needed it! There is no live trap and I can't take the pellet rifle across the border. There is a low grade antifreeze in the camp used in all of the plumbing at the close of the year but I have to assume it will not be effective if we use it in the water lines. Also, I am very handy and clever having previously built my own mouse trap using a hunk of pine log, fishing line and peanut butter to get the mouse to bite the line and drop the log on itself! We dubbed it "Thumper"! Last group says the squirrel is very active at night and kept folks awake. I don't think I will have any issue taking regular auto antifreeze across the border or just buying it there. That's an option. Any other ideas? If you have a squirrel problem in Onondaga County New York, or any other conflict with a wild animal, I am confident that we can solve it. 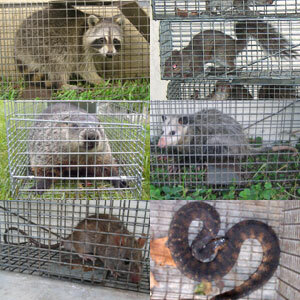 We use humane methods when dealing with Syracuse wildlife removal situations. Squirrel Control Syracuse. Our company is fully licensed and insured in New York. Call us any time at 315-816-3404 for a price quote and to schedule a same-day or next-day appointment to solve your squirrel problem in Syracuse.